By Amanda Glenn 20 Comments May 5, 2018 This post may contain affiliate links. 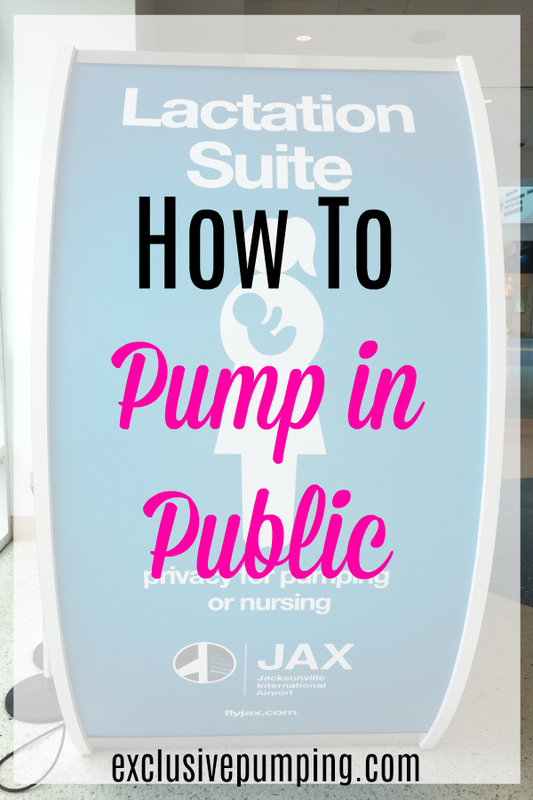 If you are exclusively pumping, it’s a good idea to try to get comfortable with pumping in public. It makes living your life a lot easier if you can, say, pump in your car between errands versus running home to do it. 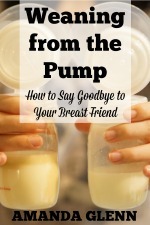 Additionally, if pumping on the go isn’t an option, it’s easy to start feeling trapped at home and resentful about pumping, especially in the beginning when you need to pump every few hours or so. As with nursing in public, whether or not pumping in public is something that you feel you can do will depend on the culture of the area you’re in, your feelings about modesty, and your comfort with the idea in general. 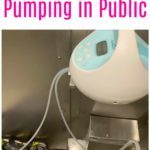 Pumping in public has an added degree of awkwardness, though, as it is a lot less common than nursing in public. Also, some people might not understand why you need to do it at that moment/why it’s not something that can wait until you get home, whereas they might be able to understand the need to feed a hungry baby. I started pumping in public in my car. Sometimes I would pump while my husband drove, and other times I’d just use it as a lactation room if we were out of the house and parked somewhere. Then, my son was sick and I needed to pump in the ER waiting room while we were waiting for him to be seen, which helped push me to get more comfortable with pumping in public. 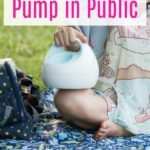 There are two kinds of pumping in public scenarios: semi-public (for example, in your car or in a family restroom) and out-in-the-open-public (such as sitting on a bench watching your older child play soccer). It might be easiest to start with a semi-public situation, and then work your way up to other scenarios if and when you feel comfortable doing so. Personally, I don’t think nursing uncovered is a big deal (though some people don’t like it), but most of the general public has never seen the complicated apparatus that is a modern breast pump and without a nursing cover you will get stares. If you use a cover, most people will have no idea what you’re doing. The two different kind of covers that work well with pumping are apron-style or poncho. Then, when you’re ready to pump, put on your nursing cover, then your hands-free bra and breast shields, and finally quickly attach the pump parts/bottle. Even if you’re a little nervous about the idea of pumping on the go, try to fake it until you make it. Start someplace easy, where you can feel somewhat confident, and then act that way. If you act like what you are doing is perfectly natural and no big deal, people are a lot more likely to not notice you. Remember, most people are far too busy worrying about themselves and what’s going in their own lives to pay attention to you. Additionally, having your partner or supportive friends around while you pump – at least at first – can be really helpful in making you feel more confident and less self-conscious. It’s inevitable that something will go wrong at some point – a curious toddler will come lift up your cover, or you’ll run into your boss when you’re out and happen to be pumping, or you’ll accidentally spill breast milk on a stranger as you unhook yourself from your pump parts. Anticipate that this stuff might happen and try to see the humor in it. You probably will laugh about it one day, and it’ll be a good story! Hopefully that will help you get started pumping in public. Feel free to leave additional tips or stories below in the comments! Ah, you’re right. I forgot which one I had. The S1 is rechargeable. The Spectra S2 also has a rechargeable internal battery. The S1 does, right? I think the S2 needs to be connected to an outlet. Can anyone recommend a good pump to use outside? I have the Medela Symphony and I can imagine carrying that around and also only works with an electric outlet. The Medela freestyle is a really good option, as is the Spectra S9! My worries about pumping in public is my pump which is really noisy. Does this seem like a problem to anyone? If you have a backpack or bag or something you can put it over the pump to muffle the sound a little? I just pumped in public today for the first time at my husbands hockey game. I pumped at 5am before we left the house to drop off his mom at the airport by 7:30a. Then we went straight to his hockey game that started at 9:50am. Knowing I would need to pump at 10am the latest, I brought my pump stuff ready to go and nursing cover. Once the time came, I left my baby with grandpa and went to pump at an outlet that was off to a corner that was a bit secluded. Either way, I was well covered so I didn’t care. I think that if you focus on why your doing it then you stop caring. I’ll definitely do it again and having a very supportive husband with a “who cares” attitude is an awesome plus. 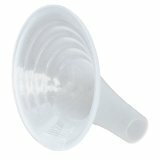 Freemie cups are definitely a must I think. Ive been using them for 4 months now and I love them. I use them when Im not home. They are awesome for driving and pumping too. Ive never done pumping in public, its always semipublic but i think the cups would help. What are the laws for pumping in public? Can I pump at my desk while working (yes, I know I’m guaranteed breaks, but ignoring that, am I legally allowed to)? Also, I LOVE the Rumina hands- free wrap bras. Wear them every day. 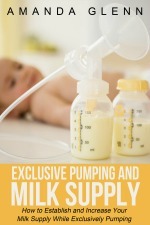 Hi Juliana, I have never been able to find any laws about pumping in public, only nursing. I don’t think the law has ever clarified it! Thank you so much for sharing your experiences. I have pumped as a passenger in the car and in the parking lot, but never out around a bunch of people. We are wanting to go to the fair in a couple weeks and I know we’re going to be there for more than 3 hours. Going all the way back to the car will only make it take that much longer, not to mention, it’s hot in the car! 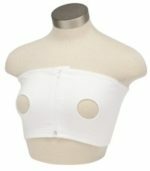 I have the Medela hands free pumping bra with the holes on each side and I can’t imagine that’s very comfortable to wear. Is there a different pumping bra that works better to wear under your clothes? You are braver than I! I pump at home or in the car. Once, I was pumping as the passenger as we were going through the Starbucks drive thru. The barista was having a full blown conversation with my husband and I and I do not think she even noticed!